Soon-to-be mothers who are unsure as to whether or not they can give their child up for adoption will be faced with a multitude of tough questions and decisions. Contrary to popular belief, the birth mothers who do decide to go the adoption route are doing so to give their child the best chances for a successful life. Through a number of life circumstances, many pregnant women come to the conclusion that raising the child at this stage in life will either be detrimental to the quality of their lives or their children’s lives. No matter the final reason, there is no wrong reason to consider adoption. Those that choose to do so should expect a certain level of benefits or assurances before going through the adoption process. For other mothers, though, the choice can be much harder to make. A is 4 Adoption is proud to be your guide throughout the open adoption process, working diligently with adoptive parents and birth mothers to create a plan that best benefits all parties involved. Our adoption center works to deliver comprehensive support and timely resolutions for your case. Unlike any adoption agency in California, our Costa Mesa center works to cut through the red tape and minimize the stress associated with waiting for results. Today, we’ll take a look at a few questions that birth mothers can ask themselves before putting their child up for adoption. If you are interested in learning more, be sure to contact our professional agents today! Can I decide on the type of adoption that I want to use for my child? Closed adoptions are the classic approach to placing children in need into a supportive family system. While not as common as before, this system revolves around prospective parents putting their name on a list and waiting for an agent to respond with a suitable child. The details surrounding both adoptive and birth parents are restricted, with case files often being sealed to prevent any disclosing of information. What results is an adopted child who knows very little about where they came from. Semi-open adoptions are useful for parties hoping for a large amount of privacy while still being able to exchange information with the other party. Letters are often exchanged, for example, minus the identifying information. Disclosing pertinent information is optional, with an intermediary working to deliver correspondences. Open adoptions consist of a much more open approach for birth mothers and adoptive parents. In this approach, everyone is able to meet and converse in order to ensure the best choice for the child. With an open flow of information, birth parents are better able to find adults that they like or feel comfortable with. Based on your agreed-upon levels of communication, the birth parents will be able to converse about and keep up with their child, from school reports to holiday gifts and more. As the birth mother, the type of adoption is entirely up to you. A is 4 Adoption is proud to offer top-notch open adoption services to deliver the best experience possible to each and every one of our clients. Yes. Your adoption agent will provide a number of possible families to choose from for your child, giving you as the parent the ultimate choice in where your child ends up. By supplying a comprehensive profile, your agent will deliver a full picture of who the prospective parents are and how well their beliefs and parenting style align with yours. There are numerous tools at your disposal here, including letters from the prospective parents and more. In the end, you and your representative will be able to identify the perfect family, supplying you with confidence during this difficult time. If you choose adoption for your child, it’s important to know that you did so out of selfless love for your baby. Supplying your child with a great life and helping to fulfill the dreams of prospective parents are also good reasons for considering putting your child up for adoption. A is 4 Adoption aims to be a superior choice over any adoption agency in California, delivering timely results that aim to optimize the end result for all parties involved. 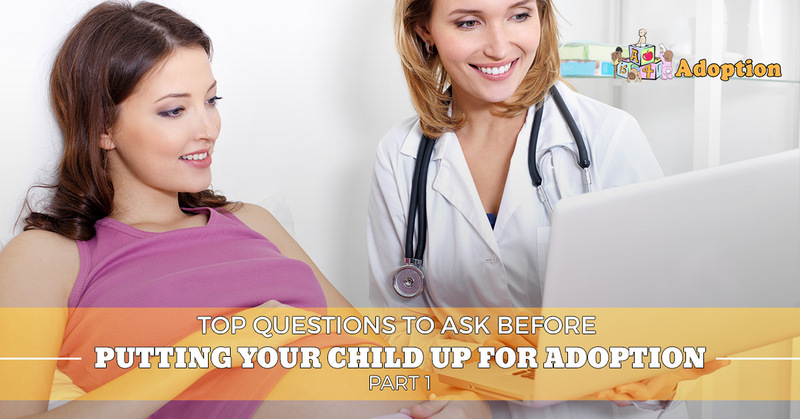 Next time, we’ll look at a few more helpful questions that may provide birth mothers help when deciding on whether or not to parent the child. Contact us today to learn more!